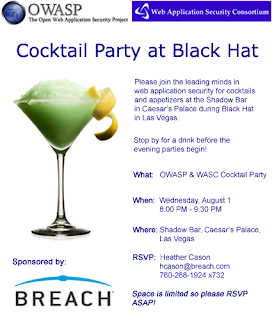 This year OWASP and WASC are combining their annual meet-ups at Blackhat USA 2007 into a cocktail party! Breach Security is generously sponsoring the event, so cocktails and appetizers will be served to all attendees. With support from both webappsec organizations, their respective members, and the industries top people expected to be in attendance...the meet-up is shaping up to be a conference highlight. I can't wait, this is going to be a lot of fun! Remember, only so many people can fit in the Shadow Bar, send in your RSVP in ASAP. RSVP'd - see you there! Right on. I heard the inbox of RSVPing is stacked already! In that article, Mr. Grossman references a December VISA statement that mentions "only one-third of the larges merchants are PCI-DSS complaint, with smaller businesses even further behind". Where can that VISA statement be found? I would like to review that. I don't recall the exact URL where I read it, but this article should have the information your looking for.